Forget the comments, I need to have a whole conversation about the workshop with you! Maybe meet for coffee next week? Wow, the weaving is beautiful! You make me want to sign up for a class! Is your scarf actually a stole? 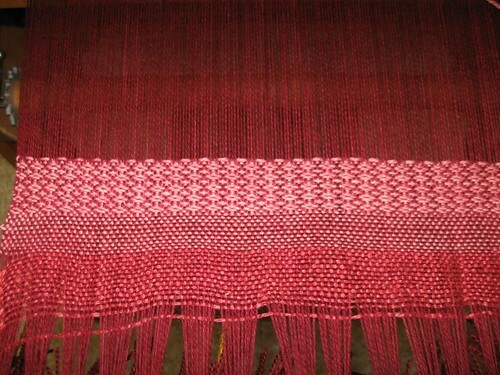 It looks wide on the loom, but I don’t know anything about weaving. I love the patterns in it though! Wow, that is so cool that you participated in that workshop! How fun! Your projects all look great, too! 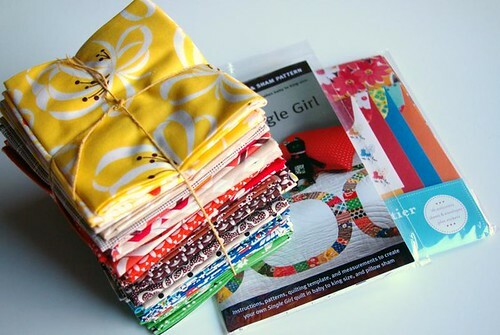 Wow – what you have on the loom is fantastic. So beautiful. The orange quilt is beautiful! And you know I love your scarf that is on the loom. The diamond pattern is one of my favs. So simple to do yet gives character and texture. Wonderful job. Check out Karma Kitties’ mushroom swap! I do love your weaving! and your pretty pink socks too. Have to let us know how they wear, the yarn sounds really soft! Great socks! Your weaving is lovely. My sweet hubby surprised me with a loom for my birthday this week.